The sphere of computer vision has enabled many technical feats in the earlier few years. We once started-off as newbies trying to figure out what the machines could do if they are able to ‘look’! Today, we have lifted a few steps from the amateur ladder of computer vision to build some sophisticated applications and devices that almost resemble cognitive abilities comparable to the human eye. Computer vision holds applications in almost all the possible fields. In healthcare, it can scan X-rays or visually scan a patient for preliminary diagnoses, in aviation, computer vision allows drones to ‘see’ and fly, a traffic camera can visually process the number of cars and rash drivers during a busy hour and so on. Why Computer Vision in Construction? Construction is a highly traditional field where businesses and individuals together spend $10 trillion annually on the activities related to it. It is a domain that often sees better equipment, more powerful machines, and improved technology, the innovations are far less seen. Also, due to the traditional nature with limited room for innovation, the construction domain also ‘lives by’ the challenges regularly. Some of them occur regularly, some have been occurring since the first man laid the first brick. Though, with the advancement in the field of robotics, AI, Machine Learning, and Big Data management technologies, the Construction industry is about to witness disruption at the global scale. 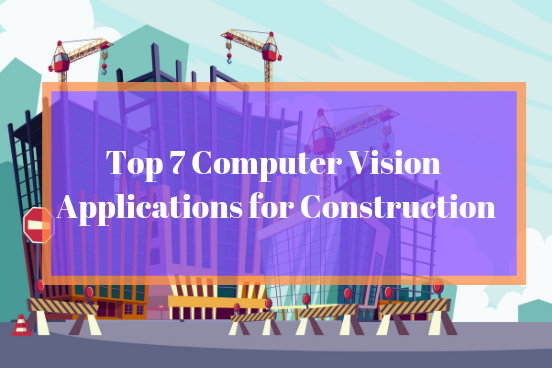 Following are the top 7 computer vision applications in the field of construction. Thanks to the gargantuan data sets available for the building construction, geographical and economic data that make Building Information Modelling a solid concept to undertake massive construction projects. Building information modeling or BIM is a concept in which employs generative design to layout the project building ‘plan’ for different teams. In short, the AI program associated with the BIM calculates the most effective solution for say the foundation laying team, electrical and plumbing team, mechanical engineering team, etc. such that the building is constructed with the highest efficiency without the individual models colliding with each other. There would hardly be any large-scale construction project in the world which would not have witnessed cost-overruns. As the size of the project increases, it becomes hard to estimate the overall cost. Even with the pessimistic over-costing, the budget often exceeds it. The solution comes wrapped in a piece of AI software that analyses the track records of the project managers for their previous projects, the timelines averaged for projects of similar scale at a similar location, etc. to give a realistic timeline. This ‘precise’ timeline prevents cost overrunning for large scale building construction. Ask any experienced construction project manager, they will say only one thing about productivity in this field. ‘It is hard to measure.’ This holds true as the, even with the latest construction technology, you cannot measure the overall productivity of a construction project. Why? Because there are so many variables and factors that affect the progress of the project! However, Computer Vision is changing this scenario. For example, a new company called Customindz has introduced a project turn-key solution that monitors construction project productivity in real-time visually. It measures the ‘inches’ a project has grown by against time, making it easier for the project managers to vary their rate of work to compensate for the progress. Construction workers face the highest probability of death on job-site simply because of the nature of the work. In fact, construction workers are almost 5 times more likely to die on the active project site than any other industry worker. This has lead to the introduction of smart safety applications powered by computer vision to evaluate the safety of a construction site with precision. For example, an app developed by a private contractor company in Boston, USA, scans the pictures of the construction site. It then evaluates them against the safety parameters of the state such as workers’ safety gear, probable hazards, probable risks, etc. The construction industry, despite new technology in construction, is facing significant staff shortage and manpower inadequacy. And, this is happening globally. Project managers, as a result of this, find it hard to decide the labor distribution and task delegation for faster construction speeds. Though, with AI, ML and Computer vision, applications are being built that utilize Deep Learning algorithms to map out the optimum manpower distribution at the construction site. Buildings are a massive source of heat and radiation. They leave a carbon footprint so large in a year, that it would take 20 passenger jets to release the same amount of carbon into the air in a year. AI algorithms powered by computer vision are helping architects and engineers develop designs that are energy efficient and leave the least possible carbon footprint. Though AI and CV have major applications in mechanical engineering when it comes to predictive maintenance, construction domain seems to be benefiting from it too. Based on the stored BIM data, AI software can prepare a maintenance schedule which is both effective and cost-efficient to undertake. As the artificial intelligence in construction and Computer Vision in construction advance further, we sure will have robot labourers working for us without getting tired, and without injuring themselves in the construction field. See you with another post soon. Adios till then! Customindz is a leading Artificial Intelligence solution provider to develop latest disruptive technologies for Construction Industry in Hong Kong and China. We specialise in Computer Vision, Natural Language Processing and Blockchain Technologies.